We’ll return to the DNSSEC Diaries soon, but I wanted to talk about a particularly interesting optical illusion first, due to it’s surprising interactions with DanKam. So what we see above is the same greenish blue region, touching the green on top and the blue on bottom — with no particular seams, implying (correctly) that there is no actual difference in color and what is detected is merely an illusion. And the story would end there, if not for DanKam. DanKam’s an augmented reality filter for the color blind, designed to make clear what colors are what. Presumably, DanKam should see right through this illusion. After all, whatever neurological bugs cause the confusion effect in the brain, certainly were not implemented in my code. Hmm. If anything, the illusion has grown stronger. We might even be tricking the color blind now! 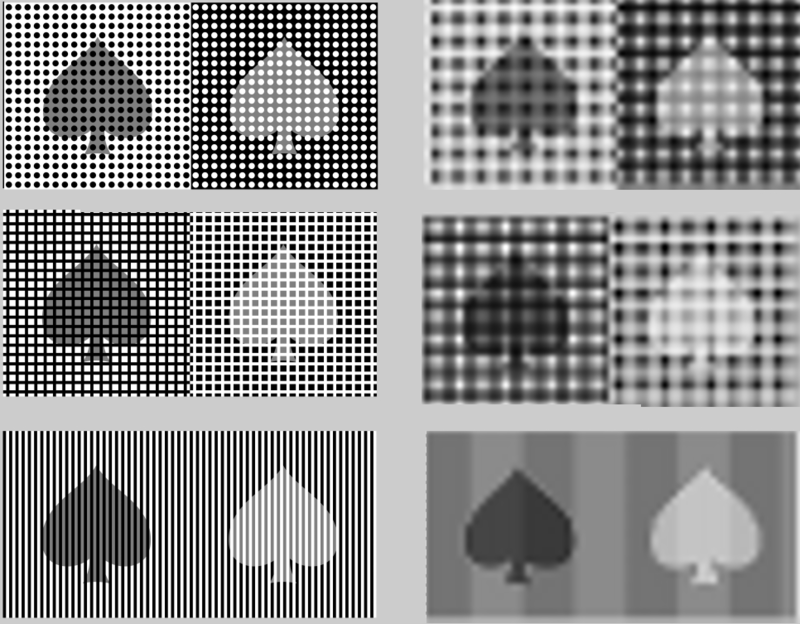 Now we have an interesting question: Is the filter magnifying the effect, making identical colors seem even more different? Or is it, in fact, succumbing to the effect, confusing the blues and greens just like the human visual system is? There’s no question: DanKam’s confusing the greens and blues, just like those of us armed with brains. What’s going on? 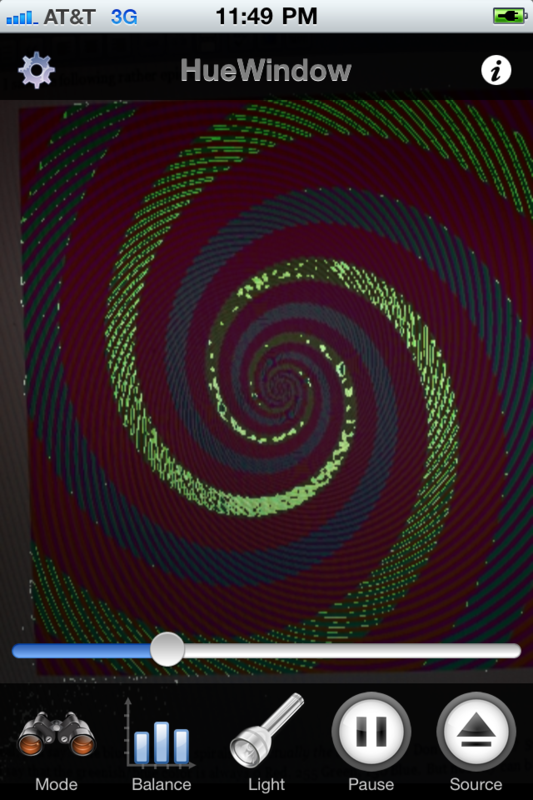 The orange stripes go through the “green” spiral but not the “blue” one. So without us even knowing it, our brains compare that spiral to the orange stripes, forcing it to think the spiral is green. 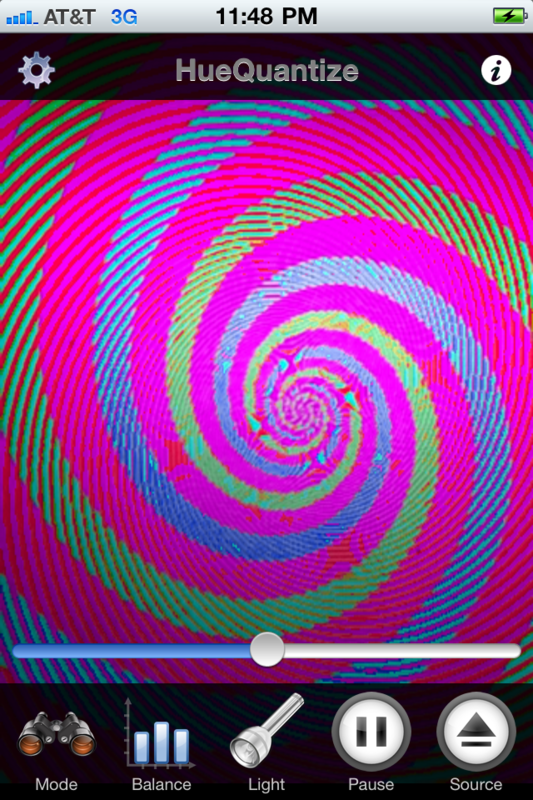 The magenta stripes make the other part of the spiral look blue, even though they are exactly the same color. 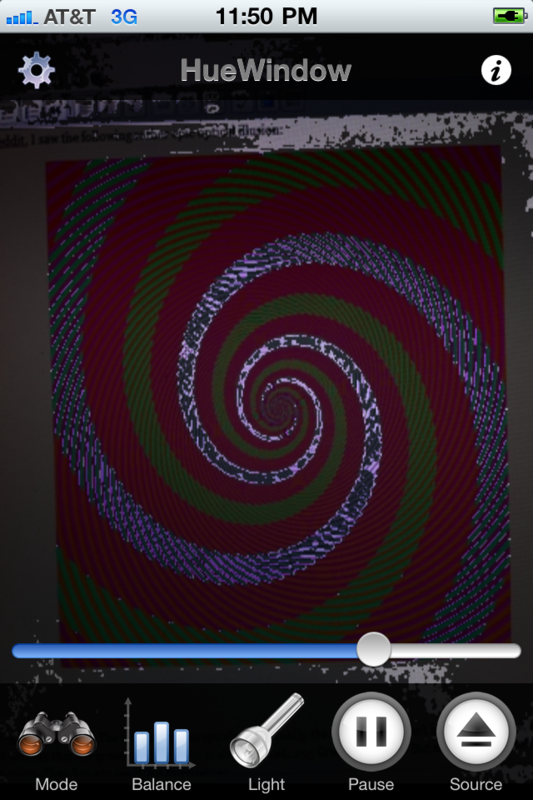 If you still don’t believe me, concentrate on the edges of the colored spirals. Where the green hits the magenta it looks bluer to me, and where the blue hits the orange it looks greener. Amazing. The overall pattern is a spiral shape because our brain likes to fill in missing bits to a pattern. Even though the stripes are not the same color all the way around the spiral , the overlapping spirals makes our brain think they are. The very fact that you have to examine the picture closely to figure out any of this at all shows just how easily we can be fooled. There is not a one-to-one mapping between pixels on the screen and pixels in the camera. So multiple pixels on screen are contributing to each pixel DanKam is filtering. 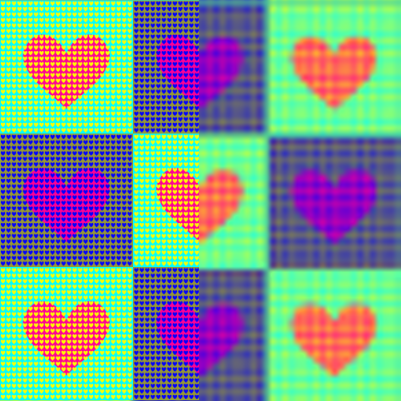 The multiple pixels are being averaged together, and thus orange (605nm) + turquoise (495nm) is averaged to green (550nm) while magenta (~420nm) + turquoise (495nm) is averaged to blue (457nm). There is no question that this is what is happening with DanKam. Is it just as simple with the brain? 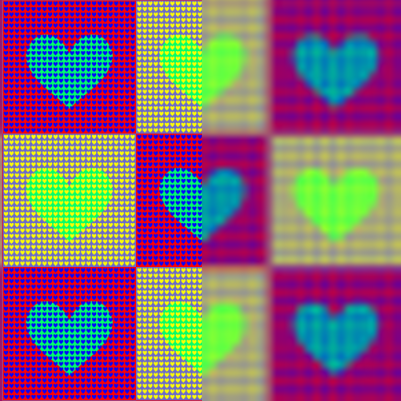 Well, lets do this: Take the 512×512 spiral above, resize it down to 64×64 pixels, and then zoom it back up to 512×512. Do we see the colors we’d expect? So, perhaps a number of illusions are working not because of complex analysis, but because of simple downsampling. No, of course not, the first rule of the brain is it’s always at least a little more complicated than you think, and probably more 🙂 You might notice that while we’re recovering the color, or chroma relatively accurately, we’re losing detail in perceived luminance. Basically, we’re losing edges. It’s almost like the visual system sees dark vs. light at a different resolution than one color vs. another. So, my theory is that these color artifacts aren’t the result of some complex analysis with pattern matching, but rather the normal downsampling of chroma that occurs in the visual system. Usually, such downsampling doesn’t cause such dramatic shifts in color, but of course the purpose of an optical illusion is to exploit the corner cases of what we do or do not see. Size matters to many color blind viewers. One thing you’ll see test subjects do is pick up objects, put them really close to their face, scan them back and forth…there’s a real desire to cover as much of the visual field as possible with whatever needs to be seen. One gets the sense that, at least for some, they see Red vs. Green at very low resolution indeed. Somebody should look more into this link between visual cortex size and optical illusions. Perhaps visual cortex size directly controls the resolution onto which colors and other elements are mapped onto? I remember a thing called topographic mapping in the visual system, in which images seen were actually projected onto a substrate of nerves in an accurate, x/y mapping. Perhaps the larger the cortex, the larger the mapping, and thus the stranger ? So how can you know that DanKam is getting the same effect? Isn’t it possible that DanKam is getting a different effect, but since the only way you can perceive it is through your brain, your brain is getting the same effect, not DanKam? Very cool. Love the analysis! I believe what DanKam is accomplishing through downsampling is only somewhat conincidentally the same as what the brain is doing in its attempt to compensate for variations in lighting conditions. As you know, the color of natural light itself varies, and light often does not fall evenly on a scene, so the visual system has multiple methods of compensation and correction so that objects will have a consistent appearance despite these variations. One of the main techniques used for this is called “Center/Surround”. A point’s color or brightness is not determined by its “absolute value” if you will, but rather its difference from an average of all the colors in an area around it. (Of course, there are other systems to compensate for some of the obvious failure modes of this system.) There are lots and lots of illusions where the same absolute color appears different because of different surroundings. I highly recommend the book “Vision and Art” by Margaret Livingstone for more information. She has put together a book filled with beautiful examples as well as clear explanations of how the features of the visual system that for the most part help us process visual information occasionally lead us astray (and how, as a visual artist, you can use that to your advantage). 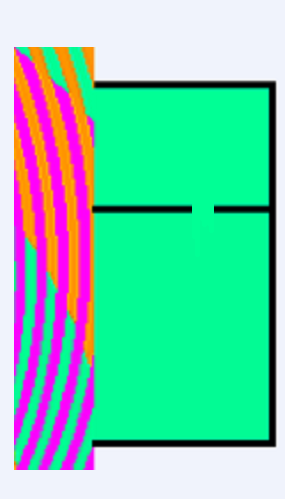 How would you design a test to differentiate between topographic downsampling and center/surround? It can be described as a series of evenly spaced black squares on a white background or a white grid on a black background. 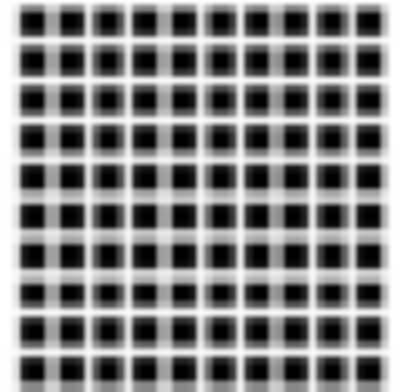 Following the latter description, due to center/surround processing the intersections of the white grid lines appear darker than the rest of the white lines. If you downsample it, however, you’d expect the intersections to appear lighter, if anything. Hmmm. What do you think about this? Note how the white line intersections are lighter than the rest of the line. You might need to measure it since this still triggers the illusion. http://imgur.com/owL27.png shows some kind of center/surround effect or something like it. I don’t know why the border goes to black. I wonder if your hitting some kind of auto-white-balance algorithm in the iPhone. 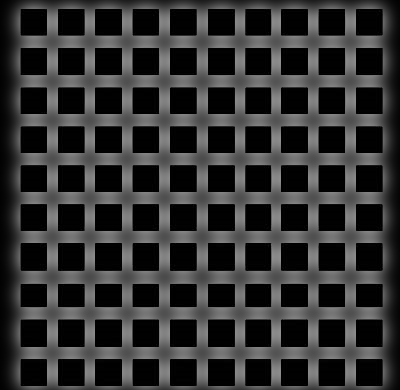 Looks like you just gaussian blurred a white-squares-on-black grid then overlayed it with the black square grid. What did you do to get this image? for what it’s worth, as a colorblind person, this part: https://dakami1.files.wordpress.com/2010/12/cropped.png seemed rather obvious to me. how do you normal color viewers see it? Pretty much that. My point is that the output looks awfully like the experienced illusion. I had always wondered how this difference in resolution between chroma and luminance detectors in the eye actually affected what we see (before the brain kicks in and puts everything into one coherent picture). I know now. Thank you! As a colorblind artist I see the optical illusions in the same way that 24 frames per second fools the brain into fluid motion. If I get my face really close to the computer screen, I do see the blue and green as the same colour.